This is a great grain-free and low-nickel option for those of us trying to detox our nickel and heal our guts as well as watch our waistlines! I make a quiche almost every Sunday so I can be lazy but still eat a healthy breakfast throughout the week. This averages to 10.02 mcgs/ugs per serving, or 60.12 mcgs/ugs in total. Sprinkle some salt and other seasoning as desired. Place into the oven while you make the filling. This releases some of the moisture from the zucchini so it doesn't make your quiche soggy. You can use up leftover zucchini gratings or chop other veggies you have on hand. Dice one bell pepper or 1-2 bok choy. Dice ½ an onion or 2 shallots. Dice up any meat you wish to add to the quiche. I suggest some bacon! Sauté all on medium-high heat in a little butter or coconut oil for several minutes to allow some of the moisture from the vegetables to cook-off so the quiche isn’t watery. While that is cooking, make the egg filling. Pull out the pie dish from the oven and sprinkle half of the cheese at the bottom. Fill the pie dish with the sauteéd filling. Carefully and slowly fill in the pie dish with the egg filling. Then add the other half of the cheese to the top. Place in the oven and set a timer to look in on it in 30 minutes. Mine was perfect at 30 minutes. Let stand to cool for ~10-20 minutes. Cut and serve with a little dollop of cultured cream (sour cream w/ cultures) on top. Once cooled, store in an air-tight container in the fridge and reheat later! 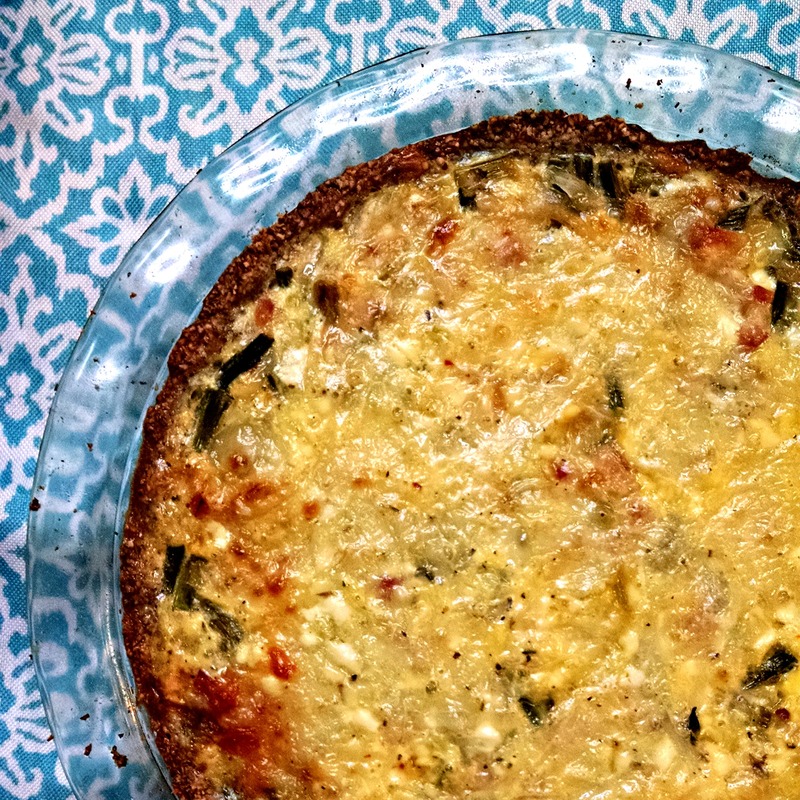 I make a quiche almost every sunday to eat for breakfast throughout the week. This is a great grain-free and low-nickel option for those of us trying to detox our nickel and heal our guts as well as watch our waistlines! This averages to 10.02 mcgs/ugs per serving, or 60.12 in total. I used nickel navigator and used US numbers or average. Get my best healthy, gut-happy, low-nickel recipes every two weeks!